Power has been restored to all fuel pond cooling systems at the damaged Fukushima nuclear plant in Japan, operator Tepco says. A power cut shut down cooling systems for four spent fuel ponds at reactors 1, 3 and 4 on Monday evening, although cooling to the reactors themselves was not affected. Pool temperatures remained within safe levels throughout, it added. Cooling at the spent fuel ponds at reactors 1, 3 and 4 were all restored by 22:43 local time (14:43 GMT on Tuesday). The cooling system at the fourth, common, pond was restored at 00:12 on Wednesday, Tokyo Electric Power Company (Tepco) said. Back in 2011 the world looked on aghast as emergency teams struggled to shut down Japan's three troubled nuclear reactors at Fukushima. International experts were already warning that the real threat came from the vast quantities of used fuel stored in enormous cooling ponds on site. Globally such radioactive waste ponds are common and therefore vulnerable to freak accidents. Most - though not all - nuclear reactors worldwide need to let their used fuel cool for at least five years before they do anything with it; many for much longer. Even if the waste is subsequently reprocessed - which itself creates radioactive waste - the plutonium retrieved has to be guarded because of its attractiveness to nuclear bomb-makers. The IAEA estimates that by 2020 the total amount of spent nuclear fuel worldwide will have reached 440,000 tonnes and three-quarters of it will be in storage, often at the reactor sites, and requiring monitoring, safeguarding and protection. There are more than 430 reactors worldwide but so far no country has developed a long-term underground disposal facility to house the deadly waste for the millennia to come. It appears as if much of the world's nuclear waste will remain on or near the surface and vulnerable to unforeseen calamities. The cause of the power failure was still being investigated, as Tepco had made restoring power the priority, spokesman Masayuki Ono said, according to Kyodo news agency. A faulty power switchboard could have caused the power outage, Mr Ono said. He added that it was the first time so many facilities had been affected by electrical failure at the same time since the plant was brought under control in December 2011. Restarting cooling to the spent fuel pool at reactor 4 had been of particular urgency for Tepco as it had the highest number of fuel assemblies stored there, Kyodo news agency reported. The company has been criticised for its delay in announcing the incident, which began at 18:57 on Monday. 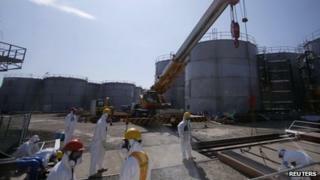 It took Tepco three hours to announce that the cooling systems had been shut down. There was no immediate threat of a radiation release. But if cooling systems had not been restored, it is possible that the water in the ponds could have started to boil. That could have led to a loss of water and eventually to the exposure of the spent fuel rods to air, releasing radiation.